Propulsion: Two 1,710shp Busch Sulzer 539 diesel engines, Farrel-Birmingham single reduction gear, two shafts. 111k Photographed by her builder while underway on 14 August 1945. Ampere - A unit of measure for the strength of an electric current. The ampere is named for Andre Marie Ampere who established the relationship between electricity and magnetism. Drake (AM-359)-an Admirable-class minesweeper-was laid down on 24 November 1943 at Portland, Oreg., by the Willamette Iron & Steel Corp. and launched on 12 August 1944. 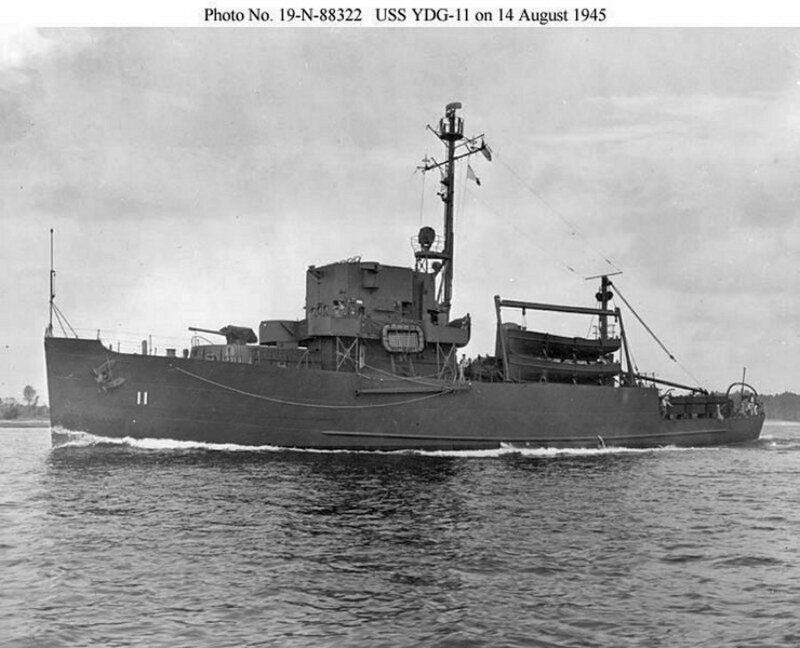 On 20 April 1945, her name was cancelled, and she was redesignated a degaussing vessel, YDG-11. The ship was placed in service on 15 August 1945, the day after Japan capitulated. Due to the cessation of hostilities, YDG-11 saw little or no active service before being berthed with the Pacific Reserve Fleet at San Diego, Calif. She was retained on an inactive, in service, status until the winter of 1946 and 1947 when she was placed out of service, in reserve. 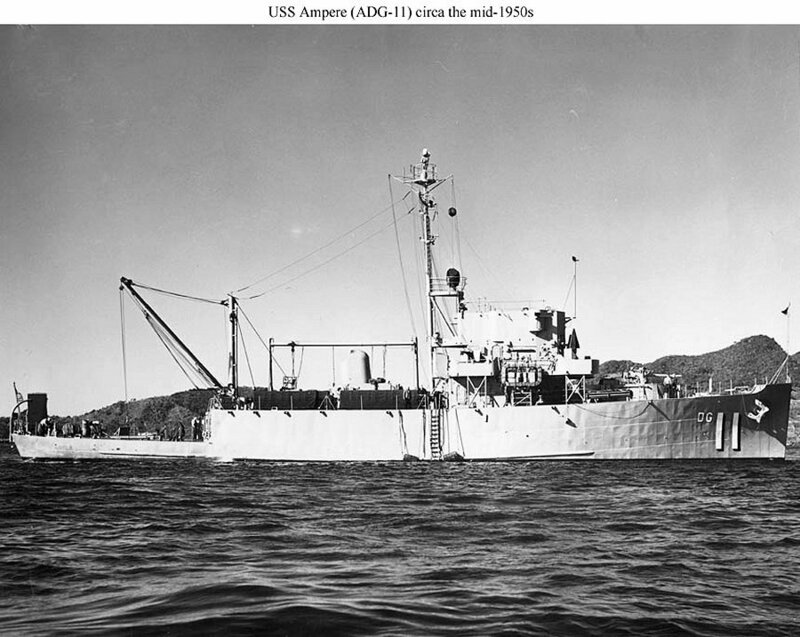 On 1 November 1947, she was redesignated ADG-11. The ship remained inactive until July 1951 when she was again placed in service. 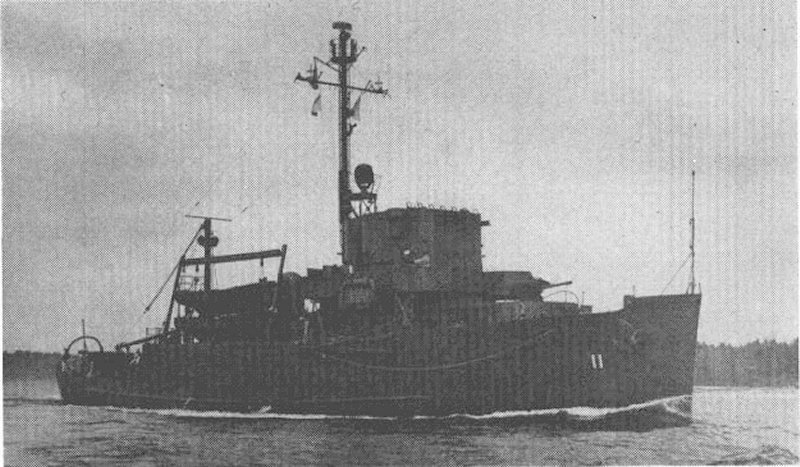 Assigned to the Far East, ADG-11 was based at Yokosuka, Japan, until sometime in 1954. After that, her home port was Sasebo, Japan. On 1 February 1955, she was named Ampere. The ship was placed out of service in February 1957. She remained in reserve in the Far East until the summer of 1961 when the decision was made to dispose of her. 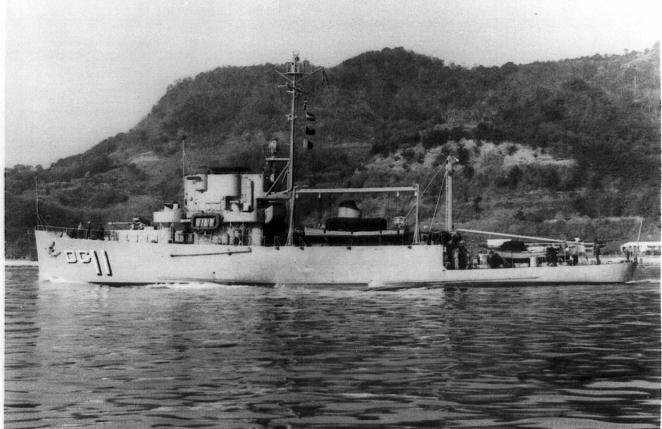 Her name was struck from the Navy list on 1 July 1961, and she was sold on 21 June 1962 to the Philippine President Lines, of Manila.